Stroll through the UW arboretum‘s Curtis prairie on an early spring evening right before darkness falls, and there’s a good chance you’ll hear the male of this bird species making these distinctive sounds as he performs his spectacular mate-attracting acrobatics. What is the name of this bird? Answers are due by next Monday (how to play the challenge). Wheeler council ring is the answer to last week’s challenge. Jens Jensen designed it to memorialize Kenneth Jensen Wheeler, his grandson, who died in 1935 just before his graduation from the UW. For Jensen, the council ring had deep meaning, symbolizing equality and democracy and having Danish and American Indian roots. 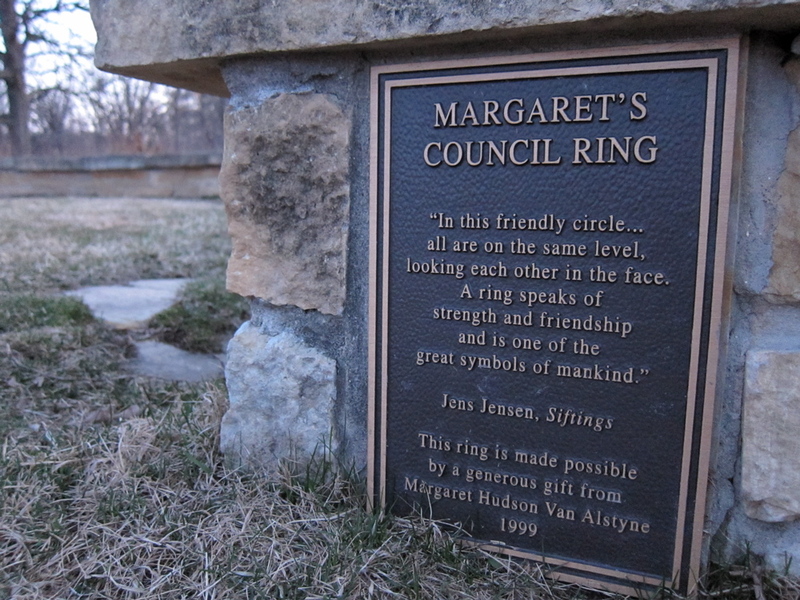 Read Jensen’s statement on the plaque of another council ring near the arboretum visitor center. Madison has more Jens Jensen connections, including Glenwood Children’s Park and a council ring on the UW campus. Not only is Jensen’s legacy of harmonious landscaping still alive, a PBS documentary is in progress. This entry was posted on March 30, 2010 at 12:20 am and is filed under audio, photo of the week. You can follow any responses to this entry through the RSS 2.0 feed. You can leave a response, or trackback from your own site. Peent! Woodcocks also perform in the morning. It’s an American Woodcock. bzzzz!